Very fine and warm cardigan.This is allready the second colour I bought. Very pleased with the cardigan and it is very warm. Received very quickly after placing the order. Lovely cardigan and exellent service. I love this cardigan which I received at the beginning of the cold snap and have been wearing ever since! Am seriously thinking of ordering another one, such a pity it doesn’t come in a light grey. Very comfortable. Looks smart. Soft wool. I am pleased with it. I have 3 of these cardigans. Perfect fit for me - cosy to wear - very good value. They wash beautifully either by hand or gentle machine wash. Fantastic selection of colours. Thank you. 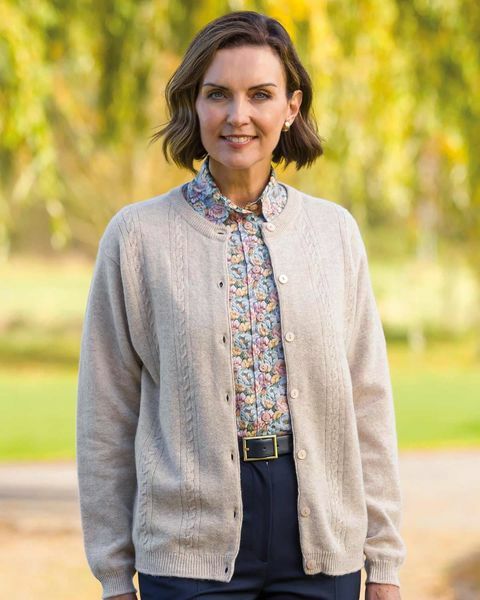 I am delighted with this cardigan which has the style and warmth of a jacket, and as I already have one in a different colour I know that they wash and wear very well and never lose their shape. Lovely soft wool cardigan excellent quality style and fit. Quick ordering and delivery. This is the 3rd cardigan in this style I have bought. Quality and choice of colours are excellent. They are nice and warm too! Delighted. I have several colours of this cardigan and love them all. This cardigan looks good, fits well and keeps me nice and warm. Warm and cosy cardigan. Good value as always from James Meade. Delighted with the cardigan. Did not have to wait long for the order to arrive. This is the forth cable cardigan that I have purchased so obviously I am well satisfied. I am still hoping to see that this cardigan is available in grey. The cardigan was for my mother who loves it although her comment was, "it doesn't have pockets for my hankies"! Lovely fit and will be nice and warm when weather gets cooler. Ladies crew neck style pure lambswool cardigan, with front cable knit design and plain back. This is a great staple item that will go with any garment in your wardrobe and help keep you warm on cold nights. Bust (Actual Bust Measurement) XS-38", S-41", M-43", L-45", XL-47"
"Very fine and warm cardigan.This is allready the second colour I bough ..."